The CMB spectrum measured by the Planck satellite points to a perfectly boring universe: the vanilla ΛCDM cosmological model, no hint of new light degrees of freedom beyond the standard model, no hint of larger-than-expected neutrino masses, etc. However at the quantitative level things are a bit more interesting, as Planck has considerably narrowed down the parameter space of inflation. We may not be far from selecting a small class out the huge zoo of inflationary models. Simplest models of inflation involve a scalar field with a potential. During inflation, the value of the scalar field is such that the potential is large and positive, effectively acting as a cosmological constant that supports a faster-than-light expansion of the universe. The potential should be almost but not exactly flat, so that the scalar field slowly creeps down the potential slope; once it falls into the minimum inflation ends and the modern history begins. Clearly, that sounds like a spherical cow model rather than a fundamental picture. However, the single-field slow-roll inflation works surprisingly well at the quantitative level. There is no sign of isocurvature perturbations that would point to a more complicated inflaton sector. There is no sign of running of the spectral index that would point to departures from the slow-roll conditions. There is no sign of non-gaussianities, that would point to large self-interactions of the inflaton field. There is no sign of wiggles in the CMB spectrum that would point to some violent events happening during inflation. One can say that the slow-roll inflation is like a spherical cow model that correctly predicts not only the milk yield, but also the density, hue, creaminess, and even the timbre of moo the cow makes when it's being milked. Let's look into more details of the slow-roll inflation. Assuming the standard kinetic term for the inflaton field φ, the model is completely characterized by the scalar potential V(φ). The important parameters are the first and second derivatives of the potential at the time when the observable density fluctuations are generated. Up to normalization, these derivatives are the slow-roll parameters ε and η (see the equation box for a precise definition). Both have to be much smaller than 1, otherwise the inflaton field evolves too quickly to support inflation. Several observables measured by Planck depend primarily on ε and η. In particular, the spectral index, which measures the departure of the primordial density fluctuation spectrum from scale invariance, is given by ns - 1=2η-6ε. Since Planck measured ns=0.9603±0.0073, we know the order of magnitude of the slow-roll parameters: either ε or η or both have to be of order 0.01. Another important observable that depends on the slow roll parameters is the tensor-to-scalar ratio r. The system of an inflaton coupled to gravity has 3 physical degrees of freedom: the scalar mode linked to curvature perturbations, and the tensor mode corresponding to gravitational waves. The scalar mode was detected in a distant past by the COBE satellite and its amplitude As is of order 10^-10. The tensor mode has not been detected so far. From the box you see that the amplitude At of the tensor mode is directly sensitive to the value of the inflaton potential, and for the slow-roll inflation it is expected to be somewhat smaller than As. In fact, the relative amplitude of tensor and scalar fluctuations is a direct measure of the parameter ε: r=At/As = 16ε. Now, the latest limit from Planck is r≲0.11 at 95% confidence level and, given we expect ε∼0.01 to fit the spectral index, it is already a non-trivial constraint on the shape of the inflaton potential. That's why in the plot of the best-fit area in the ns vs. r plane many inflationary models fall into the excluded region. 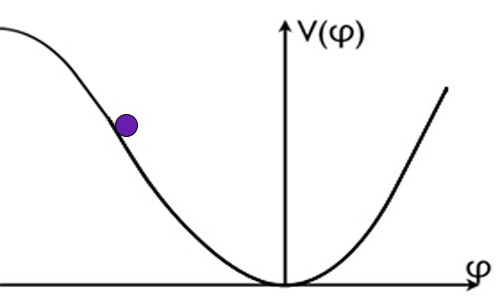 Basically, power-law potentials V(φ)∼φ^n that are too steep, n≳2, are excluded. The quadratic potential V(φ) = m^2 φ^2, perhaps the most popular one, is on the verge of being excluded. What survives are power-law potentials with n≲2, or hilltop models where inflation happens near a maximum of the potential. The latter is predicted e.g. in the so-called natural inflation where the inflaton is a Goldstone boson with a periodic cosine potential. So, the current situation is interesting but unsettled. However, the limit r≲0.11 may not be the last word, if the Planck collaboration manages to fix their polarization data. The tensor fluctuations can be better probed via the B-mode of the CMB polarization spectrum, with the sensitivity of Planck often quoted around r∼0.05. If indeed the parameter ε is not much smaller than 0.01, as hinted by the spectral index, Planck may be able to pinpoint the B-mode and measure a non-zero tensor-to-scalar ratio. That would be a huge achievement because we would learn the absolute scale of inflation, and get a glimpse into fundamental physics at 10^16 GeV!. Observing no signal and setting stronger limits would also be interesting, as it would completely exclude power-law potentials. We'll see in 1 year. See the original Planck paper for more details. Today we saw the first physics results from the AMS-02 collaboration. AMS is a particle detector attached to the International Space Station where it collects more than 10 billion cosmic ray events per year. 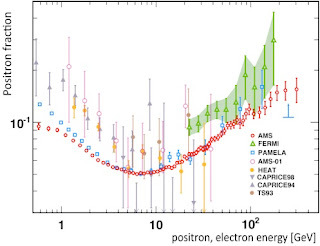 The data released today concern the energy spectrum of cosmic ray positrons. Before discussing the AMS results it's worth taking a historical detour to understand the wider context. The Universe we see is made of matter, but some small amounts of antimatter are being constantly produced by all sorts of violent processes: the scattering of high energy cosmic rays on the interstellar medium, the creation of electron-positron pairs in the electromagnetic field of pulsars, proton-proton collisions at the LHC, etc. Another possible production mechanism is annihilation of dark matter in the center of our galaxy, hence the interest of particle physicists in the subject. Dark matter may show up as an excess of high-energy positrons over the background predicted from common astrophysical processes. Assuming we understand the background. Until a few years ago the common lore was that the dominant production of positrons in our galaxy is via the scattering of high energy cosmic protons off particles in the galactic disc. This predicts the positron fraction decreasing with energy. 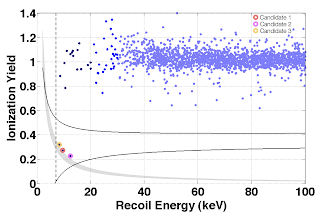 For this reason, when back in summer 2008 PAMELA reported a sharp rise of the positron fraction between 10 and 100 GeV we thought for a moment we had a smoking-gun signal of dark matter. Later, the Fermi satellite confirmed the excess and showed that the rise extends at least up to 200 GeV. However, now we don't consider the excess an evidence of dark matter. One reason is that models of dark matter that quantitatively explain the PAMELA and Fermi signal are rather baroque. 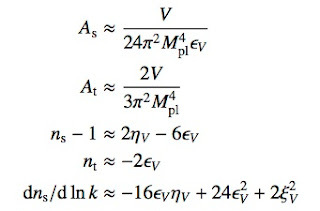 Firstly, one needs a large annihilation cross section, of order 10^-24 cm^3/sec, 2 orders of magnitude larger than the one required for dark matter to be a thermal relic. 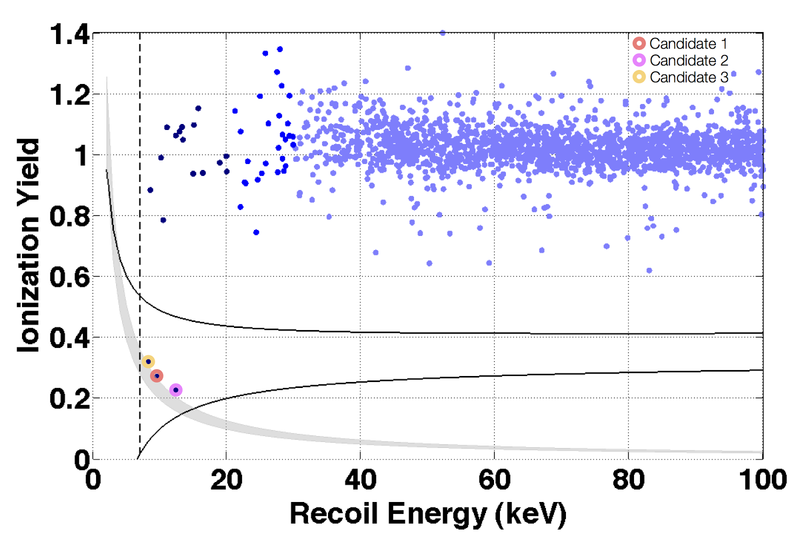 Moreover, dark matter needs to annihilate mostly into leptons and, unlike what happens in typical models, very little into hadrons (as no excess in the cosmic ray antiproton spectrum is observed). 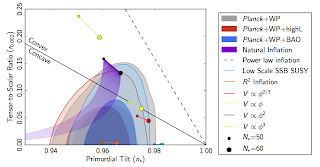 Another reason for skepticism is that any dark matter model explaining PAMELA and Fermi is in tension with constraints on the gamma ray flux from the galactic center and from the dwarf galaxies. In the meantime, astrophysicists went back to the drawing board and proposed more ordinary sources of high energy positrons. The current lore is that a few nearby pulsars could be responsible for the observed rise of the positron fraction. Thus, after the initial excitement, things have settled down in a limbo: we're sure the positron excess is real, but we cannot prove that it's a signature of dark matter, and neither we can prove that it isn't. So, AMS-02 made some bold claims today. Dark matter is mentioned 9 times in the press release, supersymmetry twice. They say that “...over the coming months, AMS will be able to tell us conclusively whether these positrons are a signal for dark matter...”. However this is just a lot of smoke without fire. There's absolutely no way that measurements of the positron spectrum may give us a reliable evidence for dark matter: not now, and not anytime soon. We simply have no robust way of telling a dark matter signal from a boring astrophysics background in that channel, because we don't know the shape nor the normalization of the background. 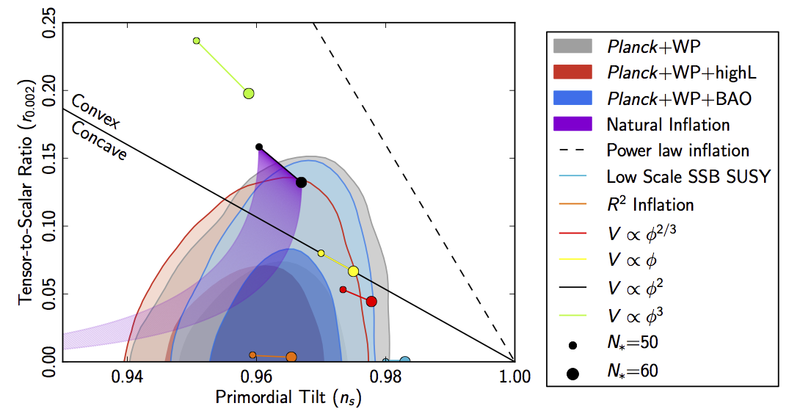 It doesn't mean that AMS cannot provide a tantalizing signature of dark matter in the future. The most important thing we learned today is that AMS works and exceeds in precision the previous instruments (which wasn't that obvious: it's the first time a serious experiment is performed on a space station, and besides the mission underwent a dramatic downgrade shortly before the launch). We're waiting most eagerly on the AMS measurements of the antiproton and anti-deuterium spectra. A correlated excess in several channels could give us more confidence in the dark matter origin. Until that happens, the history has taught us to be skeptical about any evidence of dark matter from astrophysics experiments. 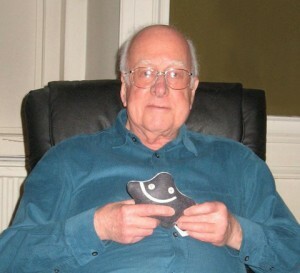 Higgs with the corpus delicti. Unbelievable but true. It happened last Saturday but only now credible reports are beginning to emerge. Peter Higgs, the physicist who first postulated the existence of a boson discovered last year at the LHC, was arrested in the Buenos Aires airport on a way back from a symposium in his honor at the University of Rosario. Reportedly, a total of 1.25kg of cocaine was found sewn into plush models of elementary particles that Higgs carried in his luggage. Higgs denies any involvement in drug trafficking, maintaining that the plush models were a gift from a young woman attending his lecture in Rosario. The whole story bears some resemblance to the case of Paul Frampton, another theoretical particle physicist arrested in Argentina last year. Given the limited information, one should not jump into conclusions. Higgs might have been a victim of a set-up: it is odd that two British physicists get arrested in Buenos Aires one after another in such similar circumstances. But, maybe, we should pose ourselves the question whether there exists a deeper relationship between the cocaine trade and theoretical particle physics? The recent dramatic events (and some of the particle physics literature too) certainly make such a relationship plausible. I will update on this story as soon as new facts come to life.